One of our company's goal is to assist in providing access to lowcost AED's and training. Our AED Training Program provides hands on skills necessary for emergency response during all phases of respiratory and cardiac emergencies. All Automated External Defibrillator (AED) and CPR training courses are also taught by certified EMT's and Paramedics who have many years of real hands on experience as well as a complete knowledge of the most up to date guidelines and techniques. Infant and Child CPR classes are also available. 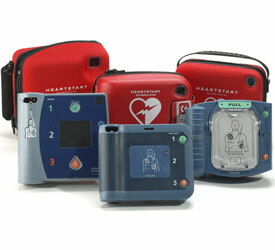 We also offer AED sales and supplies for organizations and the corporate arena. Standard and advanced first aid training classes are available on a regular basis. These courses are designed to train people to deal with everyday emergencies and should be taken by people entrusted with the care of others. All of our programs can be tailored to meet your group or organizations specific needs.